VCU teams really got into Halloween Tuesday. Check out how three squads, baseball, volleyball and women’s basketball, celebrated. Update: Brandon Rozzell is still a shooter. There are a ton of former Rams playing professionally these days, and it’s fun to check out how some of our favorites are acquitting themselves around the globe. With that in mind, let’s kick off this Monday and see how former Ram and fan-favorite Brandon Rozzell is doing in Denmark OH JEEZ HE’S SETTING THE LEAGUE ON FIRE. Say, that’s pretty good. I feel like I’ve seen this kind of shooting somewhere, but I’m having a hard time putting a finger on it. I just had one question, however. 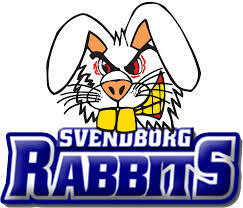 PS: This is Rozzell’s current team’s logo. This bunny does not mess around, obviously. In current VCU news, the win of the weekend goes to the VCU Volleyball team. The Rams, beset by injuries and youth, have shown flashes of potential this year, but hadn’t been able to hit their stride. That may be changing. If you’re a follower of VCU Athletics over at the DOT com site, you may have caught this great interview between Rams’ Baseball Coach Shawn Stiffler and Men’s Soccer Coach Dave Giffard. Well, these guys are pretty chatty, so something was bound to get left on the cutting room floor. That leads us to this. Giffard does as much international recruiting as any VCU coach, which is how he ended up fearing of his life on an African safari. 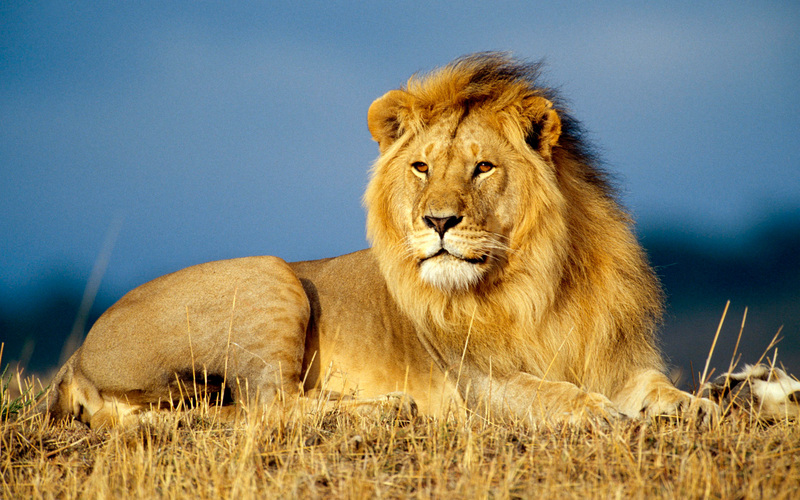 Hey, we’re not all safaris and sportsball trophies over here. You can see games and championship celebrations. But it’s important for us to reiterate that academics are the cornerstone of this department. We want to prepare these men and women for the rest of their lives, not just four years of games. This week, VCU Athletic Director Ed McLaughlin hosted an ice cream social for student-athletes who achieved a 3.5 grade point average last semester. A record 81 VCU student-athletes qualified. Also this week, spring-loaded VCU outside hitter Jessica Young, an A-10 All-Rookie Team pick last year, sat down with ESPN 950s Greg Burton. During the interview, Young discussed one of the secrets to her early success, her commitment to weight training. There’s a great chance Young can outlift you. And outjump you. And outrun you. Have a listen. Fifteen of VCU’s 18 Atlantic 10 Conference games will be broadcast on national networks. Big sportsball news today. No, not that deflated footballs thing. 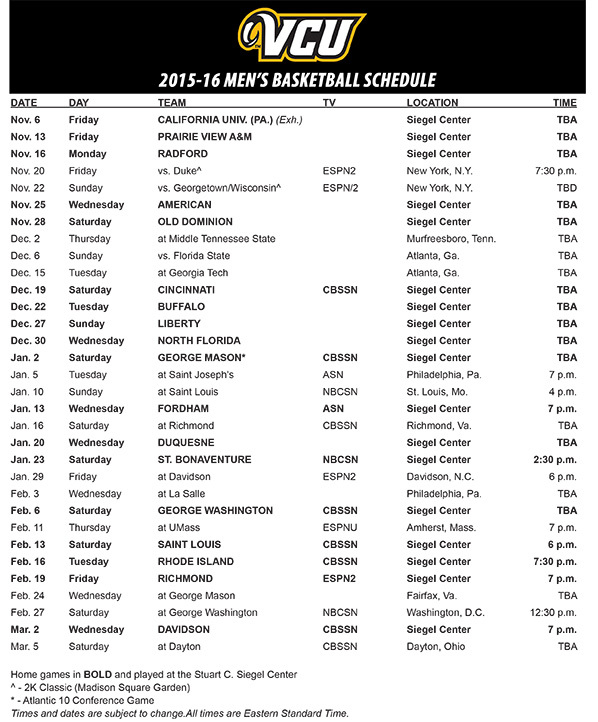 I mean, VCU released its full basketball schedule, complete with teevee information. As my 3-year-old says at the pool, let’s dive it. We’ve known about the non-conference schedule for weeks now, so I won’t get into that too much, other than to note CBS Sports Net picking up the Cincinnati game on Dec. 19. Atlantic 10 Conference play begins on Jan. 2 with a familiar face. The Rams will welcome George Mason to the Siegel Center that day. 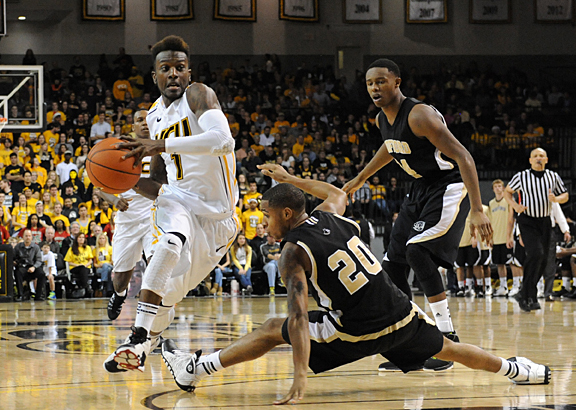 VCU swept a pair of games from the Patriots last year. Mason, however, will look quite a bit different. Dave Paulsen, a TV sitcom dad look-alike, has taken over as head coach. 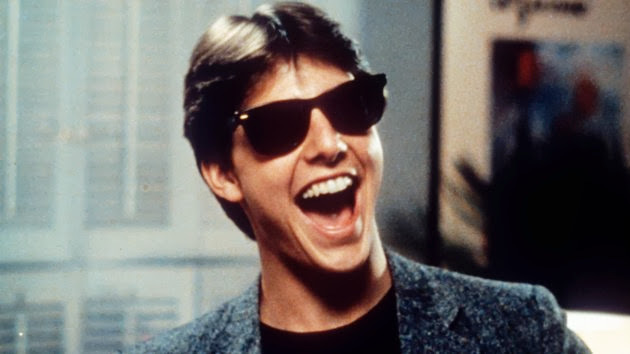 Tom Cruise took early lumps in films like “Losin’ It” before putting together championship-like performances in movies like “Risky Business” and “Top Gun”. If you had your choice to play any kid on the playground one-on-one, who are you going to pick? Are you going to zero in on some diminutive kid with a bad haircut and a busted jumper, or are you going to body up to future All-American and genetic lottery winner Johnny Riflearm? Your choice is an important one. Sure, you could run that first kid off the playground and still have time to go get lunch, but what would you learn? What would you gain, other than a false sense of confidence? On the other hand, Mr. Riflearm may block your shots, drive right past you and dunk in your grill. But I’d be willing to bet you’d be a better player for it. Similarly, VCU teams could rack up a bunch of early wins by playing weak teams. That kind of thing happens all the time. But it’s clear they’ve chosen the more difficult path, the high-resistance, high-reward path. It’s why you should be able to understand a weekend that didn’t produce much in the way of wins, but inevitably helped the Rams sharpen their edges. The VCU Volleyball team went to Purdue and took on a Boilermakers team that has been a fixture in the NCAA Tournament. The Men’s Soccer team welcomed back-to-back ranked teams to Sports Backers Stadium, Field Hockey opened on the road at Kent State and Women’s Soccer hosted perhaps the CAA’s best team in James Madison. Each coach has different feelings on moral victories, but you can’t deny the way the Rams tested some very good teams. Hopefully in the future, overtime will be a little more friendly to VCU. In the meantime, we’re going to take our lumps and move on. Volleyball is first up with Tuesday’s home opener against William & Mary. The Rams and Tribe comprised one of the CAA’s best rivalries during VCU’s final years in the CAA, and it’s nice to see the series continue. More importantly, we’re giving away free pizza and sunglasses to VCU students tonight. For you VCU students, here are a few .gifs I hope will show you how to appropriately utilize your new eyeware. Phoebe never did make it out of Central Perk. I’m no Taylor Swift fan, but, she can be an awfully likable person sometimes. 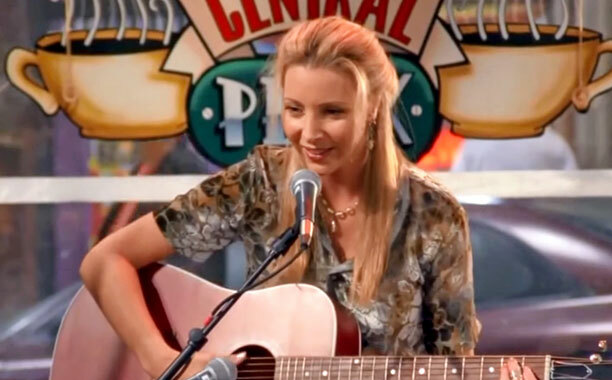 I enjoyed the heck out of “Friends” during its 10-year run, and seeing Lisa Kudrow sing “Smelly Cat”, the most memorable song in the career of Kudrow’s “Friends” character, eccentric coffee house singer Phoebe Buffay, with Swift, the burgeoning pop megastar, did spark my internal archive of the series. I uttered something similar the other day when I noticed a full weekend of VCU games, the first of the school year. We got a little teaser last weekend with the women’s soccer openers, plus some exhibitions in other sports, but now we’re going full bore. Can we be playing anymore games right now? Women’s soccer vs. Charleston, 5 p.m.
Men’s soccer vs. No. 25 Akron, 7:30 p.m.
Volleyball at Purdue, 7 p.m.
Field hockey at Kent State, 1 p.m.
Men’s soccer vs. No. 21 Coastal Carolina, 5 p.m.
Women’s soccer vs. James Madison, 7:30 p.m.
With that much action, it might be difficult for you, as a responsible VCU fan, to know what to watch. Let me help. You may notice that men’s soccer is playing two ranked teams. This will be a theme throughout the season. VCU Coach Dave Giffard has made a point of assembling one of the toughest, if not THE toughest, schedules in the country. As of right now, there are NINE ranked teams on the schedule, including the top three teams in the country. I’m pretty sure Giffard would schedule Real Madrid if compliance would sign off on it. There’s going to be a ton of top-notch soccer played at Sports Backers Stadium this fall, so make sure you catch some of it. The volleyball team will have a bit of a new look this year. The Rams will look to replace three key starters, including a couple of players who were good enough to sign pro deals. The Rams will be tested early at Purdue, a perennial Big Ten power. There’s also a bit of VCU history involved here. The Rams met Purdue in their first NCAA Tournament match in 2005. The next night the Rams draw Ohio, the alma mater of your favorite blogger and a team that is normally in the mix for an NCAA bid. There’s plenty more to keep an eye on, of course. Field hockey will be getting underway and women’s soccer looks to build on a 1-1 start, but I’ll spare you the 1,000-word blog this week. Just know you can keep up with all that stuff on VCU Athletics DOT com, as well as all of our associated Twitter accounts. Between now and then, I’m going to launch a Twitter campaign to convince Taylor Swift to invite David Schwimmer and his keyboard onstage at her next show. According to the Gregorian Calendar and the autumnal equinox, the first day of fall is Sept. 23. But Pope Gregory XIII – we all called him “Thirteen” back then – never played college soccer. The first day of fall, according to the Athletician (made up word alert!) 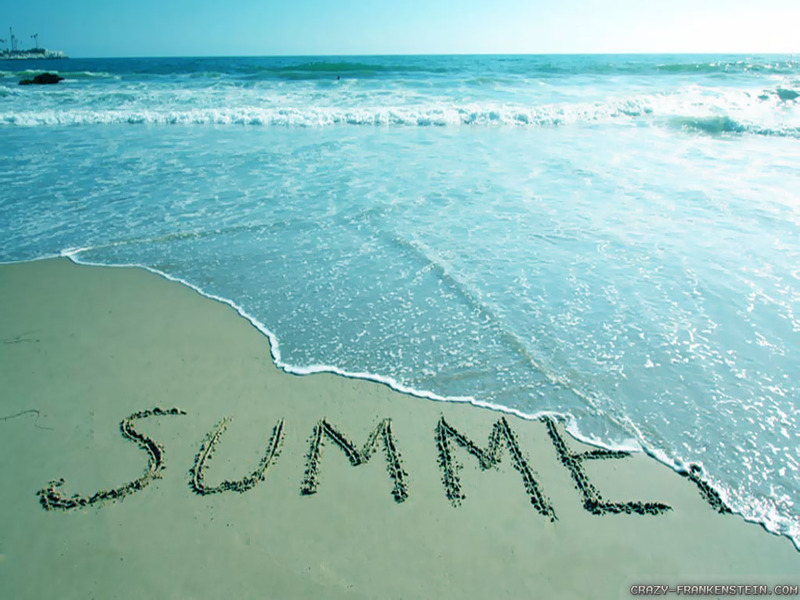 Calendar is Aug. 21. The VCU Women’s Soccer team officially kicks off (pun intended) the 2015-16 VCU Athletics season tonight when they host some school from Norfolk at Sports Backers Stadium at 7 p.m.
Now, before you make any rash decisions about your evening and commit to binge-watching the second season of “True Detective”, know a couple of things. No. 1, this season’s “True Detective” was (spoiler alert) disappointing. No. 2, we’ll have dollar hot dogs for everybody, VCU snapback hats for the first 100 students, and the Rams Gameday Garden will be open to help you cool off and relax. You’re welcome. On the field, it should be a fun season for the Rams, who finished second in the Atlantic 10 regular season last year. If you can’t make it for Friday’s VCU Soccer Kick-Off-A-Palooza, you can still catch the Rams on Sunday when they return to Sports Backers to meet Marshall at 1 p.m. There are also a few of exhibitions of note this weekend. The VCU Field Hockey team will meet Kent State on the road Saturday. Meanwhile, the men’s soccer team will host N.C. State at Sports Backers on Saturday, Aug. 22 at 1 p.m. At the same time, over at the Siegel Center, the VCU Volleyball team will host its annual Black & Gold Scrimmage. The Rams will take on a team of VCU alums, and I’ve witnessed the career of many of those players. You’ve got to love a job that reminds you how old you are on a regular basis. FYI, contributions to my retirement fund can be mailed here to my office. I’m out, but enjoy out season kick-off hype video, then go charge up the side of a mountain while dragging a Fiat. Janelle Sykes (left) prepares to sign a professional volleyball contract with Azeryol Baku earlier this month. RICHMOND, Va. – The early days of Janelle Sykes’ foray into serious volleyball didn’t exactly foretell a bright future. The Clifton, Virginia native largely muddled through three years of volleyball at Trinity Christian School, and when she finally found her way into the development-friendly club program at NVVA in Sterling, Virginia, she didn’t come bounding out of the blocks. On the first day of practice with NVVA’s 17-1s club, the 6-foot-3 Sykes dislocated her thumb blocking a ball during a scrimmage, in large part, she says, due to poor fundamentals. She didn’t get near the game floor again for weeks as she worked almost exclusively on footwork. Today, five years removed from her underwhelming club debut, Sykes can call herself a professional volleyball player. 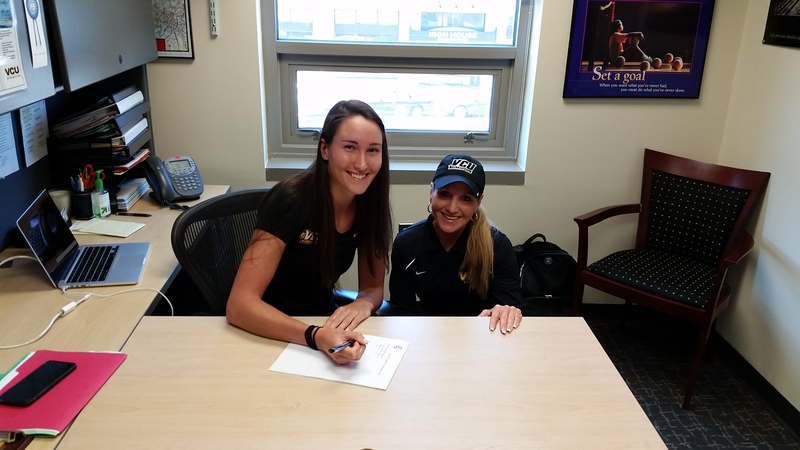 Two weeks ago, the 2015 VCU graduate signed a one-year contract (with an mutual second-year option) with Azeryol Baku of Azerbaijan’s Super League. Azerbaijan, which is located on the Caspian Sea, east of Turkey, isn’t widely known in the United States, and even Sykes admitted she had to locate the country on a map, but the country’s Super League is well-regarded in Europe. Sykes will depart later this summer. Sykes’ transformation from an awkward gym-class plodder to a professional volleyball player in five years is remarkable. She was a walk-on during her first two years at VCU. This season, she was named First Team All-Atlantic 10 and First Team All-State. She ranks sixth in school history in blocks (345). Before you watch this video, let me make one thing clear: While I did attempt to play volleyball, I did not attempt to wear the volleyball uniform. Nobody needs that at lunchtime. Now that I’ve had time to reflect, I’m pretty salty that my bar league volleyball career, circa 2001, did not adequately prepare me for Tuesday’s VCU Volleyball practice, nor did it warm me that my rotator cuff would be barking 24 hours later. Come out and see real volleyball players (actual good ones) on Friday when the Rams host Dayton at 7 p.m. at the Siegel Center. Dayton, I assume, did not ask its SID to suit up. You’ll have to show up Friday to find out. I’ll be safely out of harms way, keeping stats and making Twitter jokes. 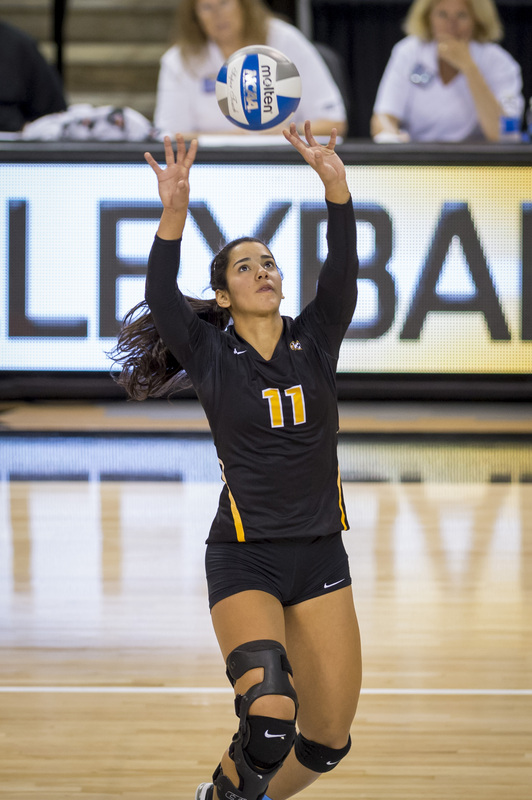 Senior setter Cecilia Aragao has returned from a torn ACL to lead VCU this season. RICHMOND, Va. – There is little evidence left of the torn ACL that derailed VCU Volleyball setter Cecilia Aragao’s junior season, other than the big, bulky, black knee brace, that is. While the brace is hard to miss, Aragao doesn’t look much different from the player that was midway through one of the best seasons by a VCU setter before it came undone in an instant. That’s good news for VCU, which needs Aragao’s smooth playmaking skills more than ever this season. Aragao, a senior and four-year starter from Recife, Brazil has reestablished herself as one of the best setters in the Atlantic 10 and perhaps the East Coast with her play during the first half of this season. It’s not just Aragao’s ability to direct Rogers’ quick-set offense that places her among the best at her position. It’s that Aragao can impact nearly every facet of the match. While she’s compiled more than 3,500 assists during her career, Aragao is the first VCU setter to record more than 300 blocks. She’s also booked more than 300 kills and 800 digs. Behind Aragao, one of just two seniors on this year’s squad, the Rams (10-9, 3-2 A-10) have won eight of 10 matches and find themselves in a position to contend for an A-10 title. But it wasn’t long ago that she wondered if she’d be able to command an offense again. On Oct. 2, 2013, Aragao suffered her season-ending ACL tear in a match against Hampton. While she was giving chase to a loose ball, Aragao rolled her ankle and then her knee. In 12 years of competitive volleyball, she’d says she’d never suffered a major injury. She knew immediately this time was different.